No one ever congratulates themselves on making a deal with the devil. They always regret it in the end. I’m not much of a comic book fan (I know…blasphemy) and I’ve had my fill with cinematic comic book adaptations *dodges rotten vegetables being hurled through the air. * There is one movie, and character, that I’ve always enjoyed, and if you know me or how my imagination works, this will come as little surprise. In my estimation, Ghost Rider is the bee’s knees. You can keep your capes and tights and masks and mutant powers; Johnny Blaze actually transforms into a fire-skulled demon riding the sickest motorcycle ever created and dispatches evildoers with flames and chains. 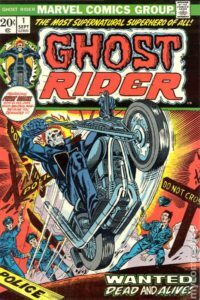 Darker comic book characters like Batman or the Punisher have nothing on Ghost Rider. I re-watched both movies this past weekend. I loathe the sequel but the first movie was flawed yet fun in a cheesy Gothic western sort of way. It was heavy metal cinema at its finest and silliest. And as all first movies do, it sets up the central conflict for the protagonist. In the case of Johnny Blaze, he makes a deal with Mephistopheles to save his father from cancer, only to have his father die in an accident. While Mephisto isn’t exactly the devil, he is pretty much the devil (played by Peter Fonda, a great choice considering the motorcycle theme of the movie). Johnny doesn’t find out the true cost of the deal until several years later, when he horrifically transforms into a fiery spirit that acts as the devil’s bounty hunter. In the presence of evil, he changes into the Ghost Rider and wreaks vengeance upon the wicked. Johnny doesn’t enjoy this, of course, and he views this power as a curse rather than a gift since he is unable to control it himself (something he later learns how to do but still doesn’t celebrate). The notion of making a “deal with the devil” is a familiar plot device in stories throughout the ages. Classic stories such as Faust and The Monk are more rooted in theology while modern characters like Spawn and Constantine and movies such as Rosemary’s Baby and The Devil’s Advocate provide quite a variety of devilish deal-making, usually with tragic results. What does the Bible say about Satan as the infernal used car salesman? Even in the first chapters of Genesis, we see him employ the old “if you do X, then Y will happen” trick. If you eat the fruit, you will become like God. In Job, God and Satan strike a deal for Job’s torment, though Satan can’t kill Job. The goal is to find out just how deep Job’s loyalty to God goes. In 1 Samuel, Saul makes a deal with a witch that she will not be punished if she conjures up the spirit of Samuel. And of course, the most audacious deal that Satan ever attempted was to try and convince the Son of God Himself to worship him in exchange for the adoration of the world (Matthew 4). Satan does not have direct power over us, not in the same way that God does. However, he is a master of trickery and psychological manipulation. He knows how to exploit our weaknesses and make temporal things seem more important than eternal things. Compared to eternity, our greatest earthly suffering is but a puff of smoke, but in that moment of our desperation, he seizes upon our yearning for salvation and instead twists it around so that temporary relief results in eternal damnation. I am currently working on a book where the protagonist disbelievingly dabbles in witchcraft in order to achieve success in his sport, but he will soon discover the disastrous consequences. In fiction, no one ever congratulates themselves on making a deal with the devil. They always regret it in the end. In real life, few people make an outright deal with the devil (and if they do, Satan is probably laughing at them). But what does happen is seeking help apart from God when our own strength fails. The reason we are given trials and tribulations is to remind us of our weakness and turn our spirits towards God. That is exactly what Satan doesn’t want, and he will do anything to stop those prayers from reaching heaven. I’m surprised you liked Ghost Rider. I couldn’t stand it. I like the special effects, of course. How often does Nicolas Cage look cool when his head explodes into a flaming skull, right? As far as deals with the Devil, I think you hit it on the head. I was watching an episode of Cutthroat Kitchen (I know, I know, a cooking show) and on the Halloween special, participants had an opportunity to make a deal with the Devil, I mean, Alton. So the one guy did it. He had a cruddy dish so he was able to not get eliminated in the round when the judge selected him. Yet, the deal was this: he couldn’t use any of his money for the rest of the game and ended up losing. That’s usually how it plays out in life. Thankfully, the Lord has better things for us! I think about your Apollyon series and how you explored that subtle them when the world on whole made a deal with the Devil and it’s consequences. Can’t wait to read the next one! Great post on an overlooked character. Who can resist the flameskull on the chopper? 🙂 That being said you are right, the Bible does not speak of deals with the devil per se. But he did say to Jesus all the kingdoms of the world are in his hand to bestow, and he bestows them as he wishes. That might explain the popularity of certain people and what they really advocate. The Bible also tells us Satan has a “hand” which is OT parlance for sphere of power and influence. We do not know how far or to what extent that hand can reach, but it is limited by both the will of God and Satan’s status as a created being. I like your conclusion. He will extend that hand of his whenever and however he can against us, to keep our prayers from ascending to the One before whom he makes obeisance. A lesson for us all. Thanks, Mark.